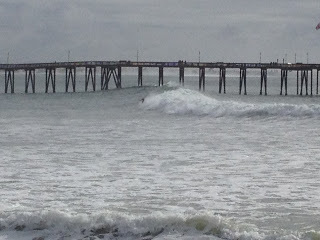 Ventura area surfers were treated to three days of outstanding surf this weekend. Calm winds allowed clean conditions nearly all day. I surfed a couple of late afternoons on the dropping tide. Something I haven’t done in months. Here’s the Pier at C St showing some size where there’s typically barely a ripple. The little black dot at the edge of the white water is a surfer. One of the smaller set waves at Pitas Point. This shot was taken from where I hope to be parking my newly acquired travel trailer this winter.